The Distance Education Learning and Teaching Academy (DELTA) is once again offering the Kickstart Week, which is “a series of related workshops that will prepare you to design for and teach in online and hybrid settings. Each day focuses on a different set of skills and pedagogies.” Staff from the Office of Teaching and Learning have attended the workshops, and have found the experience to be useful for face-to-face offerings as well – our newest member, Sean McCready, plans to attend this upcoming offering! Six faculty joined Office of Teaching and Learning staff to discuss pedagogies of inclusion during a Thursday morning event on “Inclusive Pedagogies.” The conversation was rewarding, and lasted well past the session with instructors sharing their how they approach engaging as many students as possible. Inclusive pedagogy is a method of teaching that incorporates dynamic practices and learning styles, multicultural content, and varied means of assessment, with the goal of promoting student academic success, as well as social, cultural, and physical well-being, and it often reflect the strategies we know work to engage all students. All instructors are urged to begin to assess assumptions they have about experience, knowledge, ability, identify, and viewpoints. Recognize any biases or stereotypes you may have absorbed. Rectify any language patterns or case examples that exclude or demean any groups. Attend to student identities and seek to change the ways systemic inequities shape dynamics in teaching-learning spaces, affect individuals’ experiences of those spaces, and influence course and curriculum design. If discriminatory remarks are made in your class, it is your responsibility to interrupt them and point them out as such. If you do not, students may think that you either approve of or are unaware of the impact of the comment or behavior. Do not assume that all students will recognize cultural, literary or historical references familiar to you. Convey the same level of respect and confidence in the abilities of all your students. In class discussion, be wary of unfair patterns of communication (e.g., men interrupting women, a white student getting credit for a student of colors idea) and ensure fair access to class discussion for all students. In courses in which class discussion is important, consider calling upon students rather than only relying on volunteers. Some students may be willing to participate but may not volunteer, for cultural or personal reasons. Consider who comprises panels of experts or guest lecturers. Use Universal Design for Learning (UDL) when preparing activities, materials, and presentations. 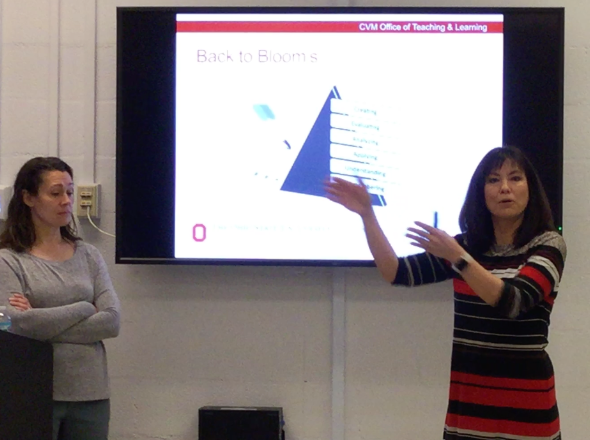 The Office of Teaching & Learning presented on “Test Questions: Best Practices and Item Analysis” during a faculty and teaching staff development session Friday morning. We are sharing the unedited version of the presentation in this update and plan to post an edited version to our website. Because the slides are difficult to see on this video, we suggest viewing the presentation and following along with this copy of the presentation slides. If you have further questions about writing test questions, please don’t hesitate to contact our staff. Kate Midnight is OTL’s ExamSoft expert. The first of two discussion session on application of instructional practices outlined in Teach Students How to Learn — the OTLs autumn semester book group selection — took place this week. Faculty attending said this particular selection was helpful in gaining insight into how students can empower themselves as learners. The Office of Teaching & Learning has shared some of the strategies presented in this text with students. In particular, we provided them with information on metacognitive learning strategies and the study cycle. Weimer suggests a two-prong approach to handling entitlement. A second preventative approach involves having a conversation about entitlement before it’s expressed. Do students know what it is? Are the attitudes ones they hold? Weimer suggests a two-prong approach to entitlement. 2. A second preventative approach involves having a conversation about entitlement before it’s expressed. Do students know what it is? Are the attitudes ones they hold? During a facilitated discussion Wednesday morning on “Trends and How-to’s of Teaching without Lectures,” faculty participants raised many thought-provoking points regarding the merits and challenges of moving away from lecture-heavy delivery of course content. The conversation was offered as part of the college’s faculty professional development series. Why do we lecture? Due to factors such as program history, curricular structures, and time constraints, lectures may seem to be the most pragmatic, straight-forward way of guaranteeing delivery of the curriculum as a whole. In addition, the prospect of receiving negative student feedback for trying non-lecture activities may be inhibiting to faculty. Dr. James M. Lang advocates for starting with “small teaching” changes, or activities that can be incorporated rather easily at the individual class or lecture level. Another idea for experimenting with small changes is flipping a class or two by assigning learning materials for review outside of class, making use of small knowledge-checking activities, and leaving class time for additional knowledge-checking, reinforcement, and application. Mini-lectures are often used in alternative delivery methods for quick provision of essential information. When and where would we consider incorporating non-lecture techniques, such as active learning? First take a look at your teaching goals and learning outcomes, then consider how those outcomes are best assessed. Brainstorm what kinds of activities and materials you can offer to your students so they achieve the learning outcomes. We call this process Backward Design. What is active learning? Activities in which students actively engaging with knowledge and application. Some techniques include Problem-Based Learning (PBL), Team-Based learning (TBL), and Think-Pair-Share (TPS). See this link for additional techniques. How do innovative instructional approaches affect grading? It’s worth looking at whether your exam questions align with learning outcomes. You might also ask the following: Is an exam really the best method for assessing student achievement of the intended learning outcomes? If not, how can exam questions be restructured to promote learning above the recall level? Are grades given to students on exams really indicative of their outcome achievement? If not there may be a better way to measure student learning. Is student learning better assessed with competencies than grades alone? If you are interested in learning more and/or having additional conversations, please feel free to contact Teaching and Learning at CVMOTL@osu.edu. You can also find the resources from the session in this Top Hat course. Teaching and Learning hosted a discussion with faculty and teaching staff regarding the merits of didactic lectures, the role and pitfalls of PowerPoint-dependent deliveries, and the advent of modern classroom pedagogical applications such as active learning. You can find the resources at this public Top Hat course. During a Wednesday, Sept. 6, presentation, Dr. Julie Byron, and Melinda Rhodes-DiSalvo, Ph.D., as well as a group of faculty, sat down to wrestle with “Answers to Tough Questions about Grading and Student Feedback.” A few highlights follow. You may already know about Ohio State’s homegrown resource center on everything CarmenCanvas, the ODEE Resource Center. But did you know that there is a worldwide community of Canvas users that is a treasure trove of tips, ideas, and shared resources? The Canvas Community is an online resource where you can get help, ask questions, share ideas, learn about upcoming changes to Canvas, collaborate with other educators, and so on. Wondering how we know so much about (Carmen)Canvas? We get many of our answers from the wonderful Canvas Guides, lively community discussions, specialized user groups, and/or the frequent CanvasLIVE webinars. Have an idea or a feature request for the Canvas development team? You can search and vote for feature ideas that others have put forward, or even submit your own. Here is a list of feature requests open for voting that the developers will consider if they receive enough votes! There are lots more to Canvas Community waiting for you to discover – for example, its game elements such as points and badges, the release notes (which we summarize for you once a month), and much more. We can’t wait to see you on Canvas Community!